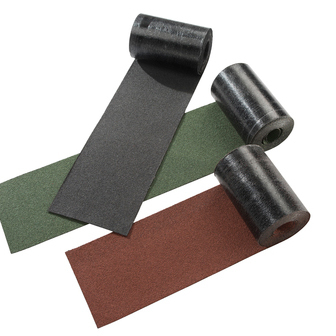 Coroshingle Detail Strip is for use with Coroshingle Shingle Tiles to dress the eaves, verge and ridge. The Detail Strip is available in Slate, Red and Green. Refer to the Coroshingle installation guide and installation video for complete installation instructions. Fixing to Eaves and Verge: Unroll Detail Strip and form a 50mm eaves drip edge and nail to the roof deck at 150mm centres. The Detail Strip can be dressed into the gutter or nailed at 50mm centres to the roof deck and at 50mm centres to the face of the verge. Fixing at Hips and Ridges: When shingles are laid and trimmed to the ridge line, unroll the Detail Strip and form it centrally over the roof ridge. Complete the fixing of the Detail Strip by applying a thin bead of bituminous sealant adhesive 25mm from the edge of the strip and nail into place. Fixings: use 20mm galvanised clout nails. Note: Coroshingle Detail Strip may not be the exact colour match to the shingles. ARIEL PLASTICS LTD undertakes to supply a replacement free of charge for any Coroshingle which is proven to have failed due to a manufacturing defect, in normal climatic conditions, for a period of 10 years from the date of purchase. This warranty is only valid providing the Coroshingle has been fixed in accordance with the manufacturers instructions: re‐erections or consequential damage costs are not included. This warranty is offered as an extra benefit and does not affect the consumers' statutory rights.